PAKRAY, Partha ; MAJUMDER, Goutam. NLP–NITMZ:Part–of–Speech Tagging on Italian Social Media Text using Hidden Markov Model In: EVALITA. Evaluation of NLP and Speech Tools for Italian: Proceedings of the Final Workshop 7 December 2016, Naples [online]. Torino: Accademia University Press, 2016 (creato il 21 avril 2019). Disponibile su Internet: <http://books.openedition.org/aaccademia/1963>. ISBN: 9788899982553. DOI: 10.4000/books.aaccademia.1963. Pakray, Partha, e Goutam Majumder. “NLP–NITMZ:Part–of–Speech Tagging on Italian Social Media Text using Hidden Markov Model”. Basile, Pierpaolo, et al.. EVALITA. 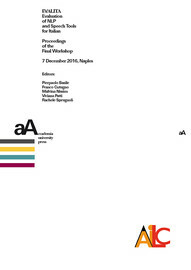 Evaluation of NLP and Speech Tools for Italian: Proceedings of the Final Workshop 7 December 2016, Naples. Torino: Accademia University Press, 2016. (pp. 104-107) Web. <http://books.openedition.org/aaccademia/1963>. BASILE, Pierpaolo (dir.) ; et al. EVALITA. Evaluation of NLP and Speech Tools for Italian: Proceedings of the Final Workshop 7 December 2016, Naples. Nouva edizione [online]. Torino: Accademia University Press, 2016 (creato il 21 avril 2019). Disponibile su Internet: <http://books.openedition.org/aaccademia/1899>. ISBN: 9788899982553. DOI: 10.4000/books.aaccademia.1899.